Blocking is one of those intensely personal things, like swatching and even knitting itself. Some of us have a laissez-faire, spritz-and-stretch attitude that suits us just fine—while others are not content until they have pinned and starched and ironed every yarn-over into total submission. Here’s a brief tutorial on how to block lace, followed by reviews of two popular blocking wire kits. How we block is a personal choice driven by our own philosophy and desired outcome, but it is also influenced by what we’re blocking. A basic hat, mittens, or scarf may not deserve the same kind of treatment as, say, Judy Gibson’s extraordinary Rose of England tablecloth. And some fibers (cashmere, qiviut, and American Bison) require more care when wet, while others (wool, silk, and mohair, depending on how they’re spun) enjoy the challenge of being stretched to the last inch of their life. But blocking does have one universal truth: Lace, or at least 99.9% of the traditional lace out there, requires it. Lace is traditionally knit using fine yarn and proportionately larger-than-normal needles, producing a crumpled and aimless piece of fabric that just doesn’t look right until you’ve stretched it wide open. And when you do, as if by magic, all your hard work reveals itself in a beautiful pattern. Blocking has a second truth: A few simple tools and techniques will make it a lot easier. The first thing that makes blocking easier is if you have a large, clean, padded surface onto which you can pin your piece. I like the portability and flexibility of the Knitter’s Block blocking kit, but others prefer solid blocking boards, a rollable piece of special foam, or the steadfast reliability of a carpet or large mattress. This part is up to you—but you do need a large smooth surface that can handle getting a little wet and being poked by pins. The second tool that will become your fast friend: Blocking wires (or, as they’re called in England, “dressing” wires). When blocking lace, part of your goal is to create an even shape with clean edge lines. In cases where you want those lines to be perfectly straight, you can pin down each edge stitch. But think about it: How many stitches went into that shawl? How many pins will you be manipulating? The other problem with the pin-by-pin approach is that blocking tends to be an iterative process where you stretch and set, then stretch some more and re-set, then stretch some more and re-set until your shawl stretches no more. If you must undo and re-set hundreds of pins for each side, you’ll quickly go bonkers. What follows is my personal protocol for blocking a straightforward lace shawl using wires (in this case, the Handworks Dressing Wires kit, reviewed in a moment). As I’ve mentioned, each person can have distinctly different ways of doing things. This is mine. The shawl you see here is Evelyn Clark’s Shetland Triangle from Wrap Style knit in my Clara’s Garden colorway of Helen’s Lace from Lorna’s Laces. First, soak your lace piece in warm water for at least 20 minutes. Don’t skimp on this step—it’s essential to relax the fibers so that they’ll move where you want them to move. Next, gather up the piece and squeeze out excess water, then lay it out on a towel and blot out more excess moisture. Your shawl is very vulnerable right now, so treat it gently and lovingly—do not wring it or hold it without supporting its full bulk. Next, spread it out onto your blocking surface. Slowly work your way along the edges, opening and straightening as you go, until the piece takes on its ultimate shape. I like to start at the top, establishing that line and then working my way down. In this example, the top needs to be blocked into a straight and smooth line. My shawl was too wide for a single wire, so I chose two full-length medium-thickness wires, one for each side of the top. Next came the sides. This particular shawl had a series of arches along the two sides, each arch culminating in a beautiful tip. Here’s where the blocking wires come in handy: I simply threaded the wire through the center stitch in each point and then slowly, carefully pulled the wire to stretch open the fabric and accentuate those tips. I’d stretch one side, stand back and study the triangle, then stretch the other side, then stand back and study, and do this repeatedly until I achieved a shape I liked. Then it was simply a matter of waiting for the fabric to dry. Some people do more at this stage: they may spritz the shawl with more water, or they may place a moist towel over the shawl and iron it, or give it a good shot of steam with the iron. That’s up to you. And then comes the final, magic moment when you release the pins, slide out the wires, and pull your shawl away from the blocking board like a weightless sheet of paper. 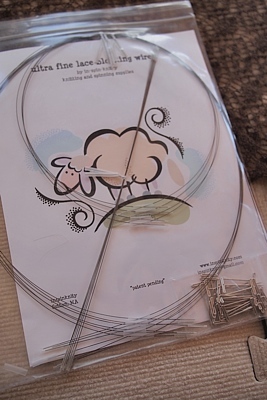 You’ll find several kinds of blocking wire kits available for knitters, most of which have different lengths and thicknesses of wire. The HandWorks Dressing Wires kit from HandWorks NorthWest was originally developed by intrepid lace-knitter Myrna Stahman (author of Stahman’s Shawls and Scarves) for the Boise Zonta Club, a global women’s service organization. But when the Zonta Club discontinued the project in 2005, HandWorks NorthWest took over the helm, with Myrna’s blessings and guidance. The kit contains 42 stainless steel wires, the ends of which have all been smoothed to a reasonably snagless finish (something you dearly care about since you’ll be poking those ends through fine strands of vulnerable fibers). There are 18 fine wires (12 are 33″ and 6 are a shorter 17″), 12 medium wires (8 long and 4 shorter), and 12 heavy wires (8 long and 4 short). The finer wires can be easily bent for blocking round pieces and/or pieces with round ruffle-like edgings. I should note that these kits don’t do away with the need for pins altogether—this kit comes with a pouch of 30 nickel-plated blocking pins. But in this context you use the pins to hold the wires, not your knitting. The kit also comes with a brief information packet explaining how best to use the kit for blocking knitted fabrics. When I first reviewed the HandWorks Dressing Wires kit in 2009, it retailed for $45. As of today, the kit’s price has jumped to $72 plus an additional $9 postage/handling for Oregon, Washington, and California; and $13 shipping for all other US states. Postage to Canada is now $30. The kit is only available from HandWorks NorthWest. Your kit comes in a long, slender, and very sturdy tube. I’m having a hard time reconciling the significant cost increase with the fact that other blocking-wire kits retail for under $20. Even if the wires are thinner and the edges rough, you could buy sandpaper, file down the ends yourself, and still end up with a chunk of cashmere change in the bank. The real draw with these wires is their fineness and flexibility. While most kits ship the wires fully extended in heavy bags or tubes, the wires in this kit have been packed in looped bundles and slipped discretely into a Ziplock bag. The packaging claims the wires will not rust, corrode, tarnish, or kink easily—and I was unable to disprove this claim. Each wire has end protectors (these wires are almost as fine as a piece of replacement lead for a mechanical pencil) and a third plastic tube about the size of a drinking straw, which keeps the wire looped. Before you do anything, you have to remove the end protectors and that third tube. When you do so, the wire instantly springs to attention, holding perfectly straight. For this exercise I chose Evelyn Clark’s Prairie Rose Shawl from The Knitter’s Book of Wool. I’d knit it may years ago with some Buffalo Gold yarn. So eager was I to bind off and wear it, I never gave it a proper blocking. In fact, I blocked it on a hotel bed with nothing but towels for support. Here it is, freshly soaked, blotted, and ready for the wires. Using the same technique as I did for the previous shawl, I selected the longest wire and began running it through the top of my shawl. The wire’s finer gauge made this task extremely easy. Thicker wires can sometimes feel as if they’re hurting the shawl, snagging or ripping the fibers. This was nimble and painless. Soon enough I’d run two long wires along the top of my shawl and two equally long ones on either side. The nature of this shawl requires that each lace “point” be secured and pulled taut, and the slender wire made this task easy. Now all I needed to do was secure the wire and begin the stretching. I sorted my blocking pins and got to work. Uh-oh. Houston, we might have a problem. Normally I begin stretching the wires by pulling out the middle and pinning it, then working my way out to each edge. But these wires are so fine and flexible, they simply pulled loose and left the stitches behind. Each time I pulled, the wire bent willingly—the only problem being that, for this particular shawl, I didn’t want it to bend as much. I persisted, slowly pulling it out and pinning frequently. When I realized I’d need to pin every point along the two sides of the shawl, I knew the kit’s 30 pins wouldn’t be enough. (They never are, in any kit I’ve used.) I dove into my stash for backup and continued. The top section, too, required more pins to stabilize. It still wobbled, but I decided it’d have to be ok.
By the time I finished my blocking, I realized this was probably not the best project for these wires. They want to be used on a more shapely garment, one with curves rather than angles. Something like Sivia Harding’s Aphrodite; or Susanna IC’s Geada, Cascata, or, my favorite, Hawthorne. Shawls with more shapely half-moon constructions would be vastly easier to block using such flexible wires. In fact, my thicker blocking wires are still bent from when I used them to block my own Hawthorne. These would’ve been perfect. It looks like Inspinknity does have a thicker yet still flexible “Premium” wire option described as suitable for more everyday use. I didn’t have access to that kit, but I suspect it would’ve been more appropriate for this particular job. Either way, what I really like about these wires is their handy portability. Their case is no bigger than a laptop computer and is as thick as a few pieces of paper. Imagine your next trip to a knitting retreat or fiber festival. It’s the night before and you’re frantically binding off that last end and preparing to block the shawl on the hotel-room bed (as I know many of us have done). Now imagine pulling your own set of blocking wires out of your carry-on bag and doing things properly. I don’t know about you, but that idea makes me smile. Do-it-yourselfers, if you’re tempted to make your own blocking wires, just be mindful of a few issues. First, they must absolutely be made of a rustproof material. You are winding them through a wet fabric and letting them sit. You do not want your heirloom shawl to be peppered with brown rust spots. Second, you’ll need to be able to sand down the tips of each wire until they are very smooth. Lace yarn is extremely fine, and animal fibers are more fragile when wet—so you do not want to run any risk of snagging or breaking a strand of yarn as you run your wire through it. And third, for rectangles and triangles, you’ll need a wire that is reliably straight. If it comes that way, great. If you think you can make it straight, be sure to try first. The example I just showed you used only four wires and didn’t even begin to show what is possible with either of these kits. But hopefully it gave you a glimpse of blocking wires’ usefulness. If you like to knit lace, blocking wires will make your finishing much easier and much prettier too. Is your lace knitting worth $40+ for blocking wires? I realize it may seem extravagant, and for some people it may be out of reach. I’d consider it a long, long-term investment in your knitterly future—on par with a ball winder or umbrella swift. Considering the amount of time and energy that usually go into lace projects, you deserve to have the perfect results, and blocking wires will take you there.